The Amalgamations Group - Groups - Manufacturing - Addison & Co. Ltd.
Addison & Co. Ltd. established in 1873, shifted gears in 1943 when it was brought into the fold of the Amalgamations Group. Since 1955, it has stamped its dominance as India's leading manufacturer and exporter of metal cutting tools and carbide tipped tools. Today, Addison & Co. Ltd. is a cut above the rest and manufactures over 50,000 varieties of standard and special tools, for a major share of the HSS Cutting Tools business in India. It exports to the developed markets of the World and is equipped to meet the most advanced International Standards. Addison is truly a "one stop shop" for cutting tool requirements across a wide cross section of users. 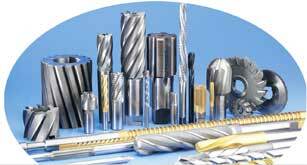 Products - Twist Drills, Reamers, Cutters, End Mills, Taps, Tool Bits, Broaches, Solid Carbide Tools and other special tools as per customer specification.